Shortly following the conclusion of Super Bowl 53 this past Sunday, it was announced by Bay Area reporter Raj Mathai that the Oakland Raiders had agreed to terms with the San Francisco Giants to play their 2019 campaign at Oracle Park next season. This news is just the latest in a long line of events in the exit strategy for the Raiders’ move to Las Vegas next year, and while Mark Davis has seemed to have found a temporary home for next season, his team may not be out of the woods just yet. According to NBC Sports Bay Area insider Matt Maiocco, while the Raiders have agreed to terms, the San Francisco 49ers would have to waive their territorial rights to the Raiders for next season, and according to reports, this has not occurred yet. In addition, the NFL would also have to sign off on the deal, which has not occurred, either. If the 49ers choose to decline waiving their territorial rights, the Raiders may find themselves between a rock and a hard place. Davis has shown disinterest in sharing Levi’s Stadium with the 49ers for a season, in addition to their inability to turn around and play one more season in Oakland. The city is suing both the Raiders and the NFL for allegedly negotiating a renewal of their lease in Oakland in bad faith. 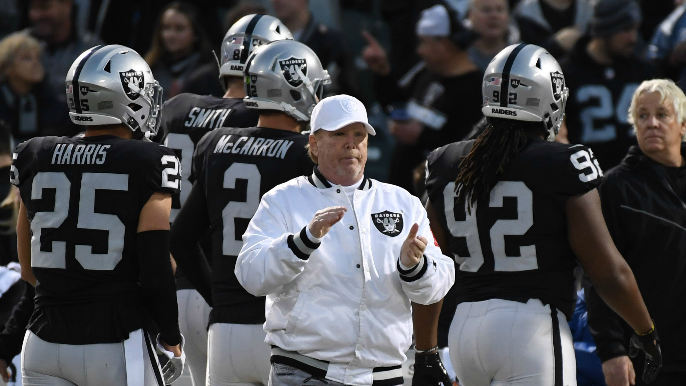 For Davis, the messy divorce from Oakland has seemed to have created more issues than it has solved, and until his palace in Sin City is ready for the Raiders’ arrival, the only place he’ll be able to call home next season is the dog house.